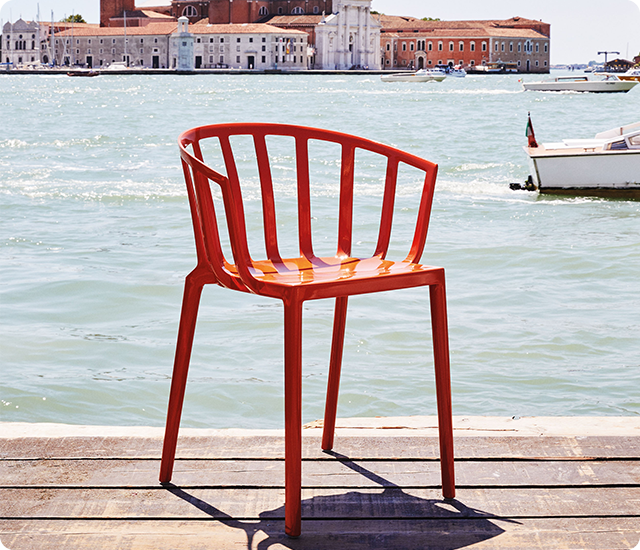 Venice, the latest member of the Kartell Generic collection designed by Philippe Starck. In 2001, the Italian Ministry for Cultural Affairs declared Harry’s Bar in Venice a national landmark. A local for the past there decades, French designer Philippe Starck has designed a chair in recognition of one of the world's most celebrated restaurants. Venice’s iconic St Mark’s Square at dusk when the crowds have drifted off for dinner. A a city, Venice is anything but generic. But this new chair designed by Philippe Starck and made by Kartell is a tribute to the history of the city, the iconic Harry’s Bar and its owner Arrigo Cipriani. A local in the city for three decades, French designer Philippe Starck has taken the Generic chair concept he developed with Kartell and applied it to a new chair that responds to the tiny cafés and bars along the canals and buried deep within the watery city. Designed along the lines and scale of a traditional living room armchair, the Venice chair interprets the mood of the small and aristocratic Venetian bar with its thousand facets. Refined and reduced in details, the result is a chair with a lightness in form and almost a discreetness in its design approach. The Generic collection, the A chair for the office, and the Generic C chairs for restaurants. But like all of Starck’s design, each chair is interchangeable and flexible across applications.